Is Diet A Bad Word? Dr Damian Kristof is an international speaker and lecturer who instills passion, animation and zest in all his audience. Damian is a chiropractor and naturopath. He is also the co-host of The Wellness Guys; Australia’s number one Health Podcast show – a FREE health information resource to help people live a healthier and more vibrant life. For more information on Dr Damian Kristof, his seminars, and other information, head to his website. With a Bachelor of Health Science, Lola knows what she is talking about. Lola’s secret: the most nutritious, healthiest food is also the tastiest. 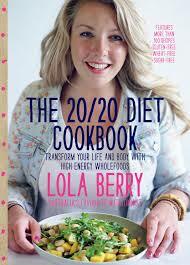 Lola has written three books: The 20/20 Diet, The 20/20 Diet Cookbook and Inspiring Ingredients. You can find out more about Lola on her website.